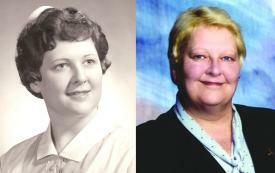 Peggy Swartz, age 64 of Richwood died Monday evening, December 5, 2011 at Marion General Hospital. She was born July 11, 1947 to the late Paul H. and Helen Laverne (Martino) Swartz. She was also preceded in death by two brothers, Danny and Kelley and special friend, Karleen Streitenberger. She was a member of the First United Methodist Church in Richwood. Peggy was a lifelong nursing home consultant. She earned her RN after graduating from Grant Hospital School of Nursing in 1968. She then graduated from Capital University with a Masters in Business Administration. She worked on The Ohio State University Kidney Transplant Team, and then was the Director of Nursing Services at Grant Hospital. After that, she served as Bureau Chief of Human Resources for the State of Ohio under Governor Celeste. She owned and operated Peg Wood Farms where she raised cattle. In keeping with her love of cattle, she served on the board of directors of the Ohio Short Horn Association. She also loved dogs and always had a pair of Keeshonds or Bichon Frises. She is survived by a brother, Jeff (Barb) Swartz, Richwood; sisters-in-law, Mary Lu Swartz, and Connie (Joe) Isler; nephews and niece, Jason (Mandy) Swartz, Nathan (Teresa) Swartz, Jennifer Swartz, Jerry (Gina) Swartz, Kelton (Dustin Hurst) Swartz and Kyle Swartz. A memorial service will be held Friday, December 23, 2011 at 11:00 AM in the Richwood First United Methodist Church with Pastor Joe Rhea officiating. Friends may call one hour prior to the service. Burial will take place at a later date at the Claibourne Cemetery. Memorial gifts may be made to the Northern Union County Fire and EMS Association, P. O. Box 15, Richwood, OH 43344. Dear Jeff, Barbara, family. So very sorry. She is in a better place. No pain. The Seiters. So sorry to hear of your sister's passing. Deepest sympathy. We are so very sorry about your loss of Peggy. Please know we are keeping your family in prayer. So sorry to hear of the passing of a cherished aunt, which I believe Peggy must have been. I remember how she provided a work experience for Jennifer and some of the nephews while they were in college. My aunts have always been dear to me so I can relate to your loss. My condolences also to Jeff and the sisters-in-law. To the Swartz family, So sorry to hear about Peggy's passing. You are all in our thoughts and prayers. May God give you strength at this difficult time. Sorry to read about the loss of your sister. You are in our prayers. So very sorry she is a very kind lady and will be missed. So sorry to hear about Peggy. I will always remember the trust she had in me when she hired me as her receptionist at Swartz & Assoc. From this grew a friendship that I will always treasure. She will be missed. Peggy Swartz: I had the pleasure of meeting you when you were the Division Chief of Long Term Care, even though; you carried the classification of Deputy Director in the Ohio Department of Human Services. You were an inspiration and leader to those who worked with you, the Nursing Home Industry, the people you served, politicians, fellow administrators, the public, numerous associations and co-workers. The Earth was graced by your presence on it ~ I am pleased and proud to have known you. I am so sorry to hear of the passing of your sister, Peggy. She was truly a wonderful person--always enjoyed talking with her, and I know she will surely be missed. I pray for peace and comfort to you and your family during this very sad time. To All of Peggy's Family - So sorry for the loss of such a wonderful person in your life. Her knowledge of the nursing home industry helped us tremendously throughout the years. She was a kind and understanding woman and will certainly be missed. Harold and Harriet Wasserbeck and Bruce and Carol Emery are saddened by the death of our cousin Peggy. Our prayers are with her friends and family. I was saddened to learn about Peggy. Many have lost a dear friend. The aging services community across the U.S. has lost a wonderful champion, advocate, trailblazer and generous friend. Thanks to Peggy's direct and indirect efforts and vision, hundreds and hundreds of nursing home residents, staff and their stakeholders realized quality care and services and greater understanding as to all that aging services can and should be. For that we can always be grateful and resolve to continue to make it so for our elders. Peggy is and will continue to be greatly missed.